Some parts of Australia, such as Darwin, and some farms and factories, are likely to be unviable in a 4°C hotter world, according to climate impacts research by Dr. Liz Hanna, from the Australian National University’s National Centre for Epidemiology and Population Health. Paul Brown of Climate News Network reports from the UN climate talks in Warsaw. UN bodies and health authorities are being advised to prepare for a world temperature rise of 4°C because scientists no longer believe that politicians are capable of holding the temperature rise below the internationally agreed limit, 2°C above pre-industrial levels. 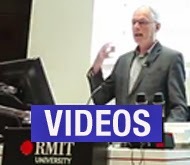 Mark Maslin, professor of climatology at University College in London, was speaking at a conference here which also heard that some parts of the world were already in danger of becoming too hot for humans to inhabit. Science and health professionals were invited by the Global Climate and Health Alliance to assess this bleak future for the human race at the end of the first week of climate talks, where little progress has been made to slow global warming. Professor Maslin said: “We are already planning for a 4°C world because that is where we are heading. I do not know of any scientists who do not believe that. We are just not tackling the enormity of the task we face to keep it below the agreed 2°C danger threshold. Professor Maslin said that scientists were in a Catch 22 situation. 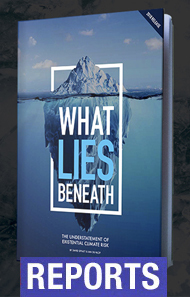 They wanted to tell politicians that it was still possible to save the planet and had shown how to do it in the last Intergovernmental Panel on Climate Change report, released in September. At the same time scientists were aware that there was not the political appetite to deal with the problem. 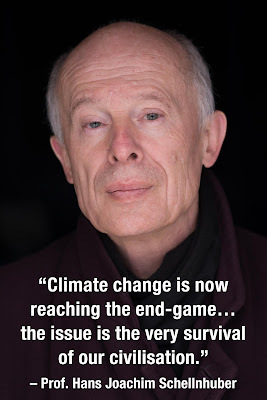 He said all UN bodies were now being advised to prepare for a rise of 4°C, because there is no evidence to show that the world is prepared to turn away from the present pathway of rising carbon emissions. Currently the temperature has risen 0.8°C on pre-industrial levels, and with the increase this year to 400 parts per million of carbon dioxide in the atmosphere it will rise further towards the 2°C threshold. Professor Maslin said: “I think everybody outside the scientific arena has underestimated the size of the problem.” The average American emits 16 tons of carbon dioxide a year, the average UK citizen 8 tons and the average Chinese 5 tons. Dr. Liz Hanna, from the Australian National University’s National Centre for Epidemiology and Population Health, said parts of her country were already reaching the threshold where it was impossible for normal life to continue because of the heat. She said the Australian Government was ignoring climate change and still expecting places like Darwin (* see note) to expand. But that was unlikely because they would soon become untenable. “If employers ask people to continue to work in temperatures above 37°C, they will be killing them in increasing numbers,” she said. Dr Hanna said humans were well suited to living in cool conditions and felt comfortable in temperatures between 20°C and 23°C because their muscles produced heat from within. 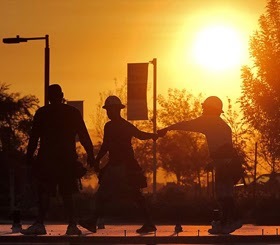 But in parts of Arizona, Australia and India temperatures were reaching - and for days staying above - the thermal maximum of endurance, which was around 37°C, the core heat of the human body. Above that temperature, and sometimes below, depending on the combination of heat, humidity and air speed, keeping cool put too much strain on the heart and people began to die. Her researches were focusing on how to keep essential services like farming, police, ambulance, district nurses, construction and mining going in a warming world. “Obviously these people will be risking their lives if they continue to try and work outside when the ambient temperature is above 37°C,” she said. * Darwin note: Penny Whetton, David Karoly et al. report in "Australia's climate in a 4°C world" (Chapter 2 of "Four degrees of global warming", edited by Peter Christoff, Earthscan) of spatial analogues for various Australia cities. That is, with the warming, what other place would now have a similar climate to the one expected for that city with 4°C of warming? For example, the analogues for Dubbo (temperate zone) on the NSW western slopes in the "hot dry scenario" are Tom Price, Yuendumu and Hermannsburg, which have grassland verging into desert. they report that: "In some cases, analogues for the new climates of Alice Springs and Cairns can only be found beyond Australia. Those for Darwin are unlikely to exist anywhere on the planet."